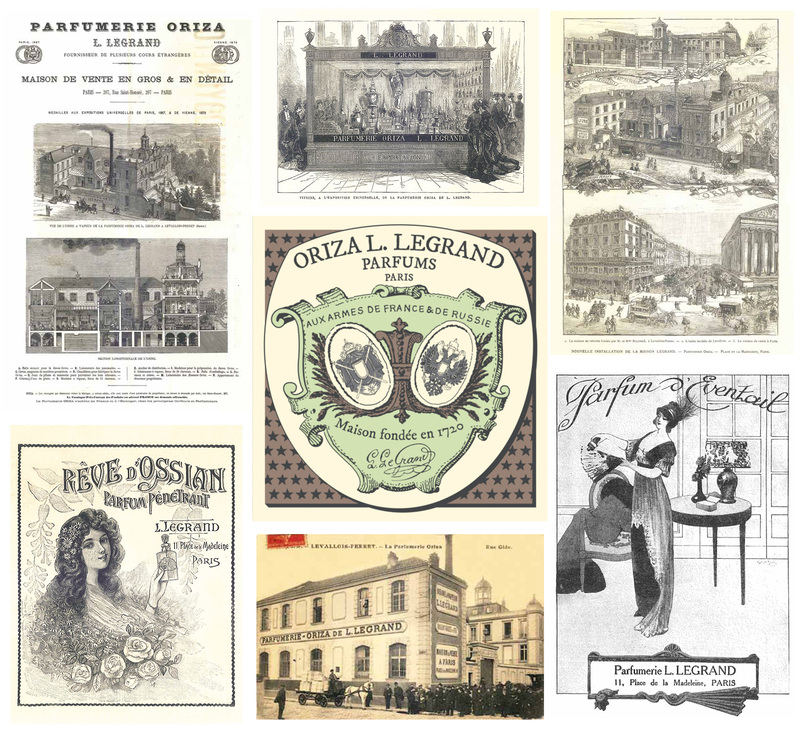 Oriza L. Legrand Perfume Giveaway: The Ten Winners! 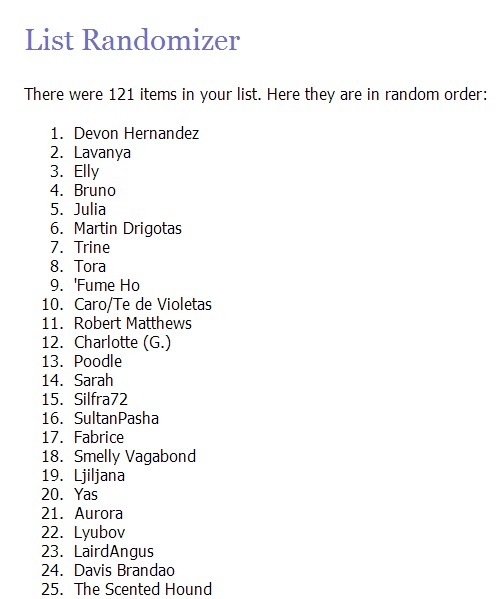 Random.org has spoken, and I have the names of the ten winners for the huge perfume giveaway so generously provided by Oriza L. Legrand Parfums (“Oriza“). Congratulations to: Devon Hernandez, Lavanya, Elly, Bruno, Julia, Martin Drigotas, Trine, Tora, ‘Fume Ho, and Caro! Each of those ten people will get ONE travel spray in a 10 ml spray of their choice of perfume. If you haven’t made up your mind yet, you have a little bit of time to read up on the 7 fragrances in the Oriza line, from the brief summaries in the first article below, to the proper reviews in the subsequent two pieces. Part III – Reviews for Relique d’Amour, Oeillet Louis XV, Jardins d’Armide & Deja Le Printemps. Oh my god, Kafka, my Chypre Mousse came today and it’s so beautiful it’s making me cry. It’s the most perfume (for me) ever. I am absolutely in love, I have no idea how they made it smell like this, and otherworldly and haunting is such a perfect description of it…. I definitely smell the violet flowers too, and they’re my favorite sort (some violets smell like bathroom cleaner to me, meh) and so well melded with the velvet green. I swear I can actually smell ferns, and I do actually know what many ferns smell like! Reve d’Ossian label. Source: Oriza L. Legrand. Of course, there are other lovely Oriza fragrances, too, each with their special character and twist. My suggestion to you if you’re torn between choices is to go with your gut and your instinctive feel. That said, please feel free to ask me any questions you may have in the comments. After all, 10 mls is a big size and most of you are working blindly, so you want to make the right choice! Don’t hesitate to let me know your general perfume tastes, fragrances you’ve loved, and, perhaps just as important, your skin chemistry. Not all the Oriza fragrances have great projection or longevity. Some can be quite intimate on the skin, and a few can be a bit fleeting. I’ve heard from a few people that one of the most beautiful Oriza fragrances from the line, Relique d’Amour, doesn’t last a huge amount of time on them. By the same token, the lovely Horizon and Reve d’Ossian can be quite be soft after a few hours. So, read the descriptions, think it over, and I’ll help if I can. Please send an email to Akafkaesquelife @ gmail . com (all one word, scrunched together) with the necessary information. If you don’t, and if I fail to hear from you within the deadline, I will give the gift to the next person on the list, and/or move the winners up by one. Oriza will send the prizes directly to the winners, and pay for all shipping costs. Given that the company is located in the Paris, and will have to individually prepare 10 travel sprays of all your varied choices, it may take some time (2 weeks, depending on your location and Customs processing) for you to receive your gift. It may take even little longer if your country has really nightmarish customs issues. Neither Oriza L. Legrand nor I am responsible for items that are destroyed by customs or that are lost in transit for some reason. Composite of old Oriza photos and adverts, created by forevergreen.eu . I would like to thank you Oriza’s two owners, Hugo Lambert and Franck Belaiche, for their enormous generosity, kindness and thoughtfulness in offering ten fantastic gifts. They have put their heart and soul into Oriza, trying to stay true to its great legacy, working to keep it relevant in today’s modern world, and doing it all on their own. I wish them nothing but the greatest success, and I fervently hope that this giveaway sparks new interest in a venerable house that goes back almost 300 years. I also hope the winners will let me know what they think of their perfume choice when they receive it and have the chance to try it. Better yet, if you love it, you can always tell Oriza, by emailing them at: Contact @ OrizaParfums.com (all one word, scrunched together). For everyone else, you can always order samples of Oriza’s creations directly from the company. The full, complete set of Oriza fragrances comes in a sample package that costs €9 for 7 fragrances, each in a 2 ml spray vial. I think it’s a great deal, and the chance to take a trip back in time. Thank you to everyone for stopping by, and may the fragrant winds always keep you safe. This entry was posted in Fragrances, Oriza L. Legrand, Perfume Giveaways and tagged Oriza, Oriza L. Legrand, Oriza Parfums by Kafkaesque. Bookmark the permalink. Thank you for participating, my dear Sultan. Heh, 25 out of 121 isn’t too, too bad. I’m the sort of person who usually ends up at 121 out of 121. LOL. OH. MY I never win anything!! But here I have!! This is so fun, Kafka! As much as I am drawn to the notes in Horizon, I am going to have to go with the Chypre Mousse. It sounds so unique and mind blowing. Thanks to you and Oriza for hosting this! I am giddy with anticipation!!! You’re very welcome, my dear. And Congratulations! Congratulations to the winners. We appreciate Kafka, it has been very exciting and cute your management. Thank you for participating, Walter. As for my management, I’m just grateful I’m not the one mailing out things! That would have killed me, especially with my post-office phobia! LOL! Congratulations to the winners! Hope each of you are happy with your respective choices! Congrats to the winners! Caro is there, too – I guess she is spellbound to Oriza, yay! Haha, I made it to the 25, but nevermind – I’ll get a sample set of Oriza L. Legrand asap!!! Thank you for trying out, Lyubov. As for Caro, it must be destiny. Really, it must be, given her unwavering obsession all these months with Jardins d’Armide! 😉 😛 As for the sample set, I hope you will let me know what you think and if you have any favorites. i think i need a few hours to decide which fragrance i really want, but i’ll email you asap! thank you so much for hosting this giveaway. It’s you, Julia, so no worries about a mistake. 🙂 And take all the time you need. Well, up to the 3-day deadline, of course. lol. why yes…..take all the time you need Julia, take four days! LOL kidding, congrats to you! 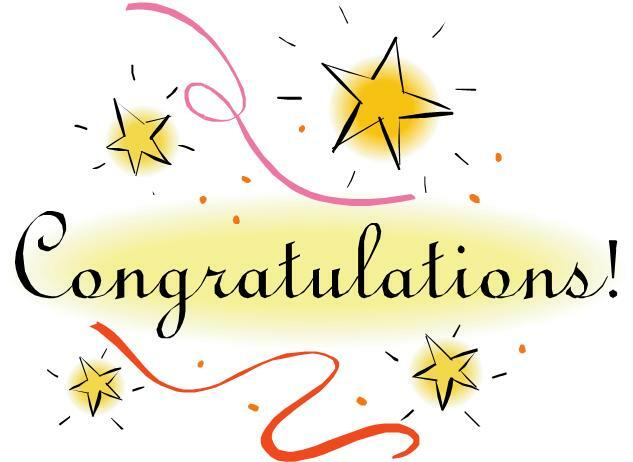 Congratulations to the winners…..he contest and delicious anticipation was a lot of fun! Thank you for making this possible for all of us! Wait, I won?! I can’t believe it! Yeeey! This latest ecstatic feedback on Chypre Mousse is adding to confusion. 🙂 Horizon is getting…blurry. Somewhat. Retreat and contemplation. Back soon, with my final verdict. “Horizon is getting….. blurry.” Hahahaha. Go retreat, my dear. Contemplate as you need. I will say that I doubt Horizon could up-end your patchouli favorites, and it’s not a hardened, straight patchouli so much as a Coromandel type of patchouli in the sense that it gets softened and sweetened with cream. The hard patchouli of the opening with all the Armagnac doesn’t last, especially not in intensity. But if you’re looking for a patchouli that is ultimately creamy, soft, sweet and somewhat sheer, then that would be Horizon. Curiosity, and some seductive wording. Every time I read this, I laugh. The tone just kills me. You sound like you’ve got Stockholm Syndrome and have just undergone Chinese water torture. *grin* I really need to stop laughing about it all, but I can’t. Is it necessary to tell you that the first thing I did this morning was check your winners list? Honestly, given you and that perfume’s love affair from a distance, it was CLEARLY destiny! And Random.Org obviously agreed as well. LOL. I was THRILLED when I saw your name pop up and saw that you’d squeaked in by the hair of your chinny chin chin! I never win anything so thank you so much Kafkaesque and Oriza. 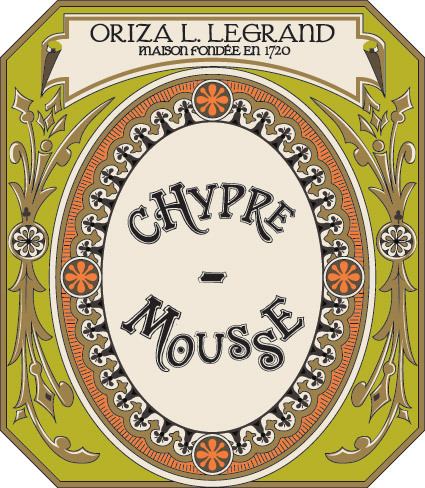 I will have to try the Chypre Mousse without question. Your description was beyond enticing….it sounds like a fairy tale elixir beyond the grasp of us mere mortals. I’m very happy for you, Martin. 🙂 Send me your address for me to pass along to Oriza, along with your choice of Chypre Mousse. And, again, Congratulations! Oh wow- I won. I was having a very tiring day so this provided a nice burst of energy.Thank you to you and Messrs Lambert and Belaiche. I will probably go for Chypre Mousse otherwise I will always wonder.It sounds ahmaazing! Do you think I will like it? We do have common loves. Is it similar to Ormonde Woman (I found that one too sweet and not green enough).. Horizon starts off as pure booze, to the point that you smell of brandy and cognac with a dash of amber and patchouli. Then, it turns into a creamy, sweet, softened patchouli. More Coromandel-like patchouli than something like Les Nereides or hardened, spicy patchouli of old. Chypre Mousse is not spicy at all. Not an Oriental hint in sight. 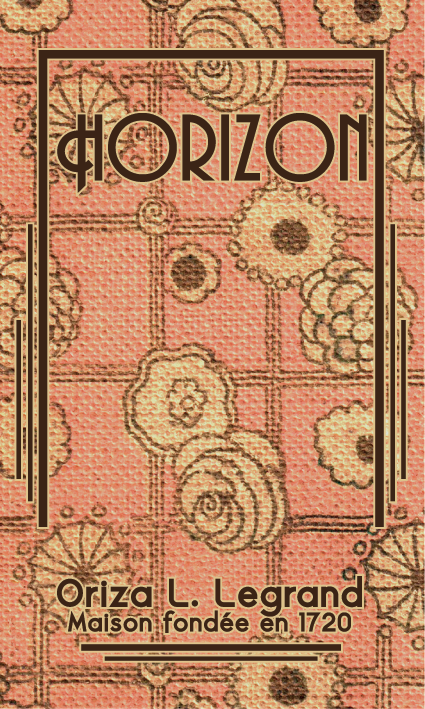 Horizon is definitely an oriental patchouli-amber. It’s not a sillage or longevity monster, but the opening 15 minutes are strong. Much stronger on clothing than on skin, but still strong. After that, though, it softens and then continues to soften. Chypre Mousse is much more noticeable and potent, and for far longer. Perhaps what you need to decide is where you would like to visit, in your mind’s eye: Druid or Scandanavian forests at midnight? Pollen-heavy white lilies in a old 11th Century monastery that is near a very green field outside? Or a library filled with old manuscripts in an old Russian Orthodox monastery that has been gently warmed with some amber candlelight? As for skin chemistry- my main ‘skin characteristic’ is sweet ampingness :). Also, I do tend to favor bolder perfumes..I might just go for the Scandinavian Forest- just for the excitement of it. I think it is certain I will like the lilies whereas the Chypre seems a more riskier and in turn maybe a more rewarding choice :). We’ll see :). I love Chypres so if this has any chypre-ness about, there is a chance I will love it. No, Chypre Mousse is nothing like Ormonde Woman. On my skin, that one is very woody, peppery and, as you noted, with sweet bits. Chypre Mousse is foresty, leafy, ferny, mushroomy, with delicate hints of violets and the wet, loamy earth. The visuals are all shades of green with some dark bits from the forest floor, while Ormonde Woman is dark woodiness and green from woods. I’m not sure if that’s helping or if I’m making sense. LOL. If it helps, I think Chypre Mousse has a De Profundis feel of dewy wetness and nature. Totally different fragrances in notes, but the mood and feel is the same. Thanks Kafka! And I meant not complaining not ‘complaint’ lol..
Oh WOW – thank u, thank u, THANK U my dear Kafka !!! 🙂 How fabulously thrilling !! You’re very welcome, my dear. And LOL at your description of Random.org! 😀 Hahaha. My question to you: what is your skin like in terms of keeping a perfume? Both in terms of sillage and longevity, what does your skin do? I think that should be a definite factor in making your decision! Skin’s ok actually, [if a little dry]. 🙂 Think pretty much average skin & chemistry. I get pretty good longevity generally too. And I tend to have a preference for woody orientals & generally more robust, heavier frags, [M7 has never budged off my top 10, for eg. ], rather than wan or transparent. [tho there’s always exceptions of course]. And tho I do luv deep mossy & inky dirty rooty vetiver types of ‘green’ – generally/usually ‘green’ scents are not my thing. [unless they more like Dans tes Bras for eg.] Or let’s just say I tend to prefer my green ‘rougher’ rather than ‘fresher’. [‘evergreen’ rather than ‘grass’] 🙂 And it’s not that I dislike ‘green’ scents, but more that I tend to overlook them. Your specific mention of ‘De Profundis’ is one thing has me a little worried. As it’s just one of my ok Lutens. I’m sorry to say I found it a little ‘thin’ & boring. But then, never liked the scent of chrysanths, so … . YET after all this, am still leaning towards your beloved Chypre Mousse. Whilst Julz is of course ‘batting-eyelashes’ at me for Horizon. 🙂 Whilst Reve d’Ossian is trying to sneak in nonchalantly. – Oh I don’t know ………..
Awww, I’m so flattered you used my late night obsessive perfume and fairy tale babbling in your post ~blush~. Hello everyone. I have two sample sets of all 7 one of which is completely unopened and the other I tried a spray of Horizon and Chypre Mousse. I also have one 10ml decant of Chypre won in this contest. The fragrance just does not work for me. I would be happy to trade or sell if someone is interested. I am looking for Jovoy Private Label, Hard Leather or vintage M7 but will consider anything. I can be reached at mdd0987@gmail.com.